Collecting a debt in United Kingdom can seem impossible. Language and cultural barriers, foreign laws and customs, and sheer distance all impose serious challenges. Debt recovery is simpler when you use a collection agency fluent in the laws and customs of the country where the debtor resides. Cedar Financial offers on-the-ground representatives in United Kingdom who understand the debt collection practices that work to support full recovery of your funds. With offices in over 150 countries, including United Kingdom, working with Cedar Financial provides you access to a global network of nationally licensed debt collectors. Our in-depth understanding of local laws, customs and cultures guarantees the best possible debt mediation results. 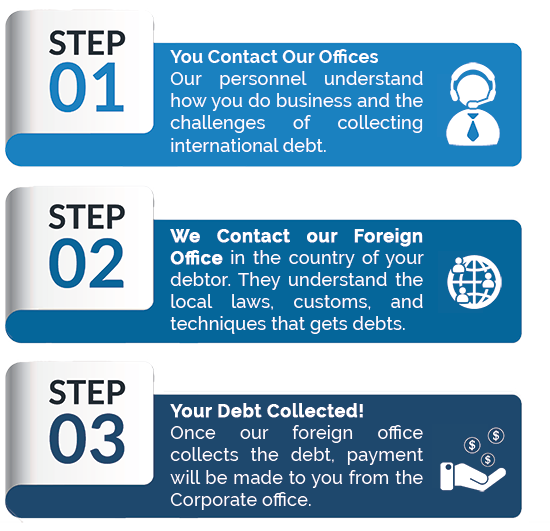 Why should we ask you to collect our debts in United Kingdom? We are true cross-border debt recovery professionals and won an industry award in 2013 for the quality of our cross-border knowledge. Acting for foreign clients in the UK adds a level of complexity and we are best placed to manage international clients from a local perspective. B2C, B2B - all client types and any trade or industry sector. We are truly a full service debt collection agency. The typical debt collection process lasts about 3 months. This of course does not account for disputes that may arise in the course of the process. After 3 months if the file permits, we will make a recommendation on the next steps, which could include filing suit. Yes, but we decide when this is necessary as costs are high. If the client is willing to pay for a visit, this can always be arranged. Yes, preferably. The client needs to be able to supply documentation at short notice upon request as we have a duty to supply it to the debtor upon request. Yes, are offer litigation services to all accounts that are deemed to be worthy of filing suit. We will provide an estimated cost and timeline to our clients for their decision. On B2B transactions compensation interest and reasonable debt collection cost can be added by Law. On B2C debts, there is no Law. Interest and costs may be added in line with contractual terms but debtors and their representatives will often insist that they are waved or frozen and it is good & common practice to do so.